The GIS Lab is provided by the University Libraries to support the use of GIS for coursework and research by UW students, faculty, and staff. Groups are welcome to work together on GIS assignments in this space. GIS Lab staff are available to assist lab users with locating geospatial data, integrating data into GIS projects, and basic ArcGIS functionality. Lab staff cannot provide extended assistance with the completion of course assignments. Lab users are strongly encouraged to consult with their faculty and/or TAs for assistance with, or clarification of, course assignments. You must be a student, faculty, or staff member of the University of Washington to use the GIS Lab. UWNetID login is required to access software applications on the computers. You must backup your GIS projects to your own media before you leave the lab. ALL DATA LEFT ON WORKSTATIONS WILL BE AUTOMATICALLY DELETED AFTER 15 MINUTES OF INACTIVITY AND/OR NIGHTLY, NO EXCEPTIONS. The GIS Lab is located west of the Government Publications Reference Desk on the ground floor of the Suzzallo Library adjacent to the Government Publications Stacks. Printing is available from library workstations for a small fee at several central locations. Please click here for more information on printing from library workstations. Lab staff can provide assistance with basic GIS tasks such as discovering data for your project, getting data into your project, and basic geo-processing tasks. TAs and instructors remain the primary source of information about assignment scope and requirements. 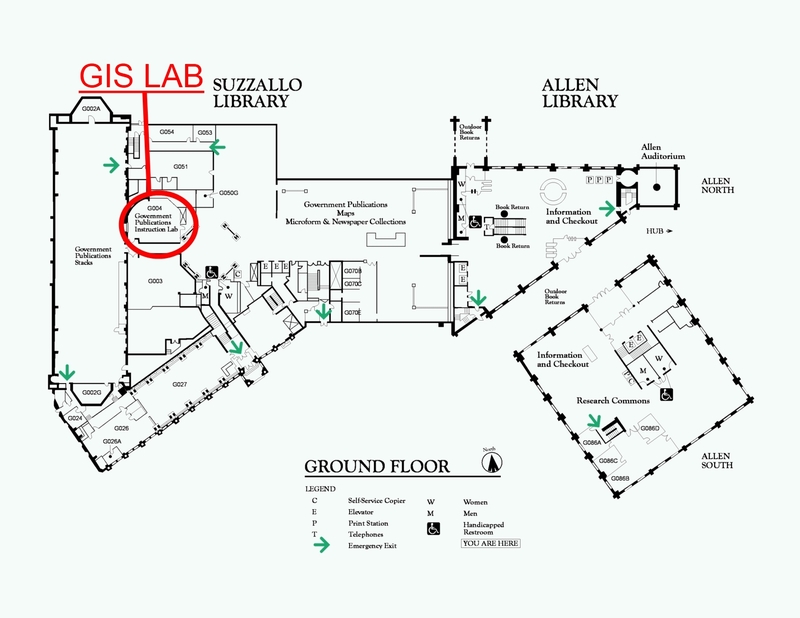 The GIS Lab is open for drop-in use all building hours unless previously scheduled. A daily schedule is posted on the door. GIS Assistance is available in the lab as noted below. OR email your question to uwlib-gis@uw.edu. Open to students, staff and faculty of the University of Washington with a UWNetID. Computers require UWNetID login to access applications. Login failure will require presentation of a current, valid UW ID (Husky Card) to remain in the lab. Computers and ESRI Software are for educational, non-commercial, University related projects and research ONLY. Please familiarize yourself with the ESRI/UW Site License for more details on use restrictions. No food, drink, or smoking is allowed in the lab. Users requiring GIS software are given priority use of computers in this room during designated GIS Lab hours. If the lab is full and people are waiting to do GIS work you may be asked to give up your workstation. No general computer support is available from lab staff. Lab staff will only support GIS applications consistent with the Lab Mission Statement. We support collaborative group work, however, noise is to be kept to a minimum. Disruptive patrons will be asked to leave. The Libraries Code of Conduct and Library Computer Use policies will be enforced. The Libraries does not bear responsibility for loss or damage of data or disks that occurs in the lab. Staff will attempt to assist in the recovery of data but cannot guarantee its recovery. The client accepts the risk that data can be irrecoverably lost. All clients must be aware of and abide by all federal copyright laws and any data licenses or use restrictions. See the UW Copyright Information Page for details. All legal restrictions about the use of university resources apply. The lab closes at 10pm Sun-Thurs, 6pm Fri and 5pm Sat. Begin saving your work and backing it up at least 30 minutes before the lab closes. See our file storage and back-up pages for options. The Libraries Code of Conduct and Library Computer Use policies will be enforced. Each workstation is equipped with a 40GB hard disk for temporary file storage. You will not be able to store files on the workstation for any longer than you are actually sitting and working in the lab. ALL DATA LEFT ON WORKSTATIONS WILL BE AUTOMATICALLY DELETED AFTER 15 MINUTES OF INACTIVITY AND/OR NIGHTLY, NO EXCEPTIONS. You are responsible for backing up your data before you leave the lab. You have a couple of different options for backing up your data which is described in the How do I backup my GIS project? While you are using one of the lab computers, you may store files temporarily in the My Documents, Desktop, C:\Downloads, C:\WorkSpace, and C:\Temp folders on that computer. Please back up your files before you leave because they will be deleted when you log off. Only staff will install software. If you require an application, web browser plug-in, font, utility, or other software for your use, please use our feedback form with your request. Your request will be reviewed by libraries staff. Personal belongings left at an unused computer will be transferred to Lost & Found at the Information Desk, Allen Library North when the lab closes. If your belongings are not there, they may have been transferred to the lost and found at Condon Hall.